Whether it's greeting guests, leading arts & crafts classes or baking cookies, volunteers create a loving "home away from home" for families. "Meals from the Heart" volunteers create delicious treats for guests, and our Children’s Program volunteers lead playtime activities for children offering respite to parents of seriously ill children. 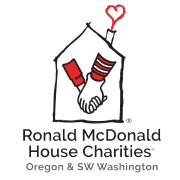 Would you recommend Ronald McDonald House Charities® of Oregon & Southwest Washington? Great charity with history of creating positive change in the community.